Last week afforded a mild and pleasant surprise at work. 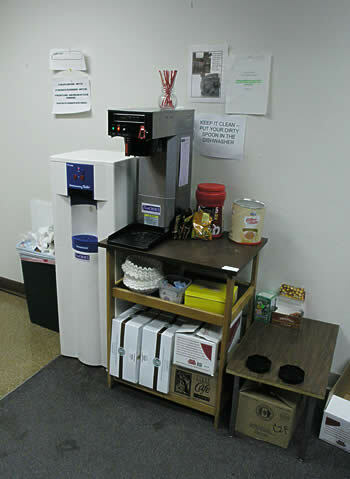 Suddenly someone made the decision to pay to get quality filtered water installed, and the free coffee was also upgraded to Starbucks, with the whole new setup for that. Now, I'm not a coffee drinker at all, but the filtered water is an appreciated bonus. The water that comes out of the tap at work is absolutely dreadful. I can't bear to smell it, much less drink it. This new, refrigerated and filtered dispenser is very welcomed. When I first started working at C2F, they had one of those machines that you replace the large 5-gallon jug atop the dispenser. I guess the budget became more important than employee satisfaction and health, and it was removed shortly after my arrival (I had nothing to do with it!). But thankfully, after almost 4 years, it was mysteriously returned. I hope it's back to stay this time! It might actually motivate me to drink water more than once a month. I'm one of those picky drinkers that has to have my water no less than 1 degree below freezing and absolutely pure. If there is even a hint of chemical flavoring or staleness, I can't stand it one bit. To celebrate this joyous occasion of the renewed source of acceptable water for drinking, I made this [very] short animation, entitled AguaLaunch ...made using a combination of Blender 3D particle effects and Serif Movie Plus 5.